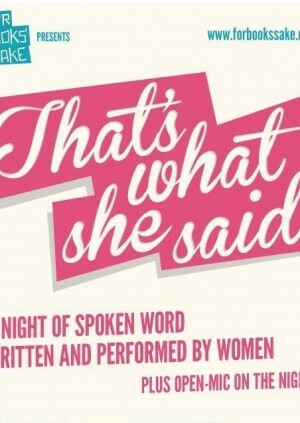 "The biggest spoken word night in London for women" (Evening Standard) is back for a rabble rousing 2018! Jemima Foxtrot (@JemimaFoxtrot) is a writer, performer, musician and theatre-maker who blends powerful, sonic-heavy words with snippets of song in her distinctive and powerful voice. Jemima has written commissions for BBC 2, BBC Arts, Channel 4 and Tate Britain. She has written three solo poetry plays which tour nationally: Melody and Above the Mealy-mouthed Sea with her theatre company Unholy Mess and Rear View with experimental theatre veterans I.O.U. All Damn Day, Jemima’s first collection of poetry, is published by Burning Eye Books. Layla McCay (@LaylaMcCay) is a storyteller/spoken word performer and Director and MC of Perfect Liars Club, a popular storytelling show that sells out monthly in Washington, Tokyo and Tel Aviv. She has performed all over the world in storytelling, comedy, and other spoken word shows, mostly performing stories based on her own life, plus story-based stand-up comedy on themes that include women, science, and literature. She has won Moth storyslams, and performed stories for up to 1000-person audiences. A Washington Post review described this as 'storytelling at its finest' and DCMTA said 'McCay has a passion that's palpable and her enthusiasm for the show helps to carry it and make it as delightful as she is.' I have my Netflix debut on 1 February in new TV series The Mortified Guide. I was blown away. I left feeling inspired, with renewed confidence in my own abilities, and almost missed my tube stop on the way home trying to write down scraps of poetry and prose. And remember - For Books' Sake is a volunteer led, community organisation so all your pennies will be going back into championing women writers!